Early this year I decided to give my 27-year-old Super Galaxy a few more years of touring life. 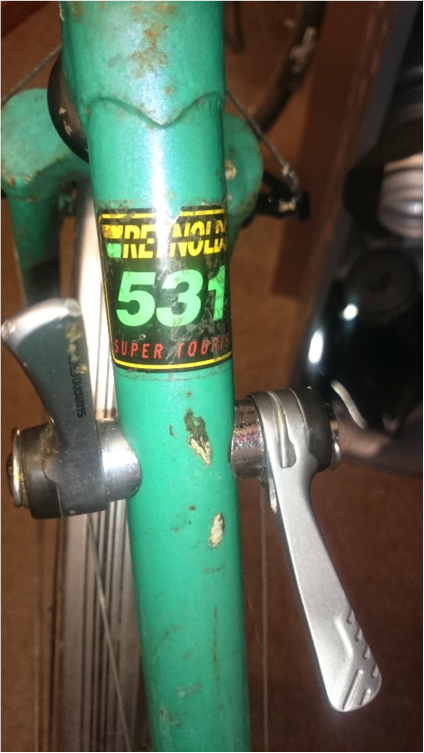 I had been only using it for the odd shopping trip recently; the brakes were poor, the gears slipped, the wheels and tyres were mismatched and the frame was somewhat rusty and sad-looking. First stage: take it all apart. Easier said than done! For repainting the frame I had to separate the forks from the headset, and remove the bottom bracket. Neither would budge, and after trying all hints I found on the internet I took it down to Clive Mitchell’s for help – even they found it hard work. Aluminium parts: Handlebars, stem, brakes, cranks. All looking very dull and lifeless. Lots of time with fine emery paper, and finishing off with metal polish, had these parts looking almost new (except for the odd scratch too deep to remove). I made the mistake of trying to remove the bars from the stem, which resulted in the Dawes engraving on the bars getting spoiled. Also, didn’t need to clean up the cranks because I later had to buy new ones anyway (see later). Gearing: I wanted to extend the ratios to make the bike more suitable for touring (i.e. having luggage) and going up hills – I wasn’t getting any younger. A bit of research showed I could get a 10-speed cassette and changer (Mountain bike type) to give me 12-36 on the back, together with my existing 46/36/26 chainwheels. Alas, the new chain (10-speed compared with the previous 7-speed) was too narrow for the old chainwheel arrangement and it kept getting stuck in the gaps. I tried adjusting spacers etc but with no luck, so ended up buying a new chainset suitable for a 10-speed chain. Wheels: One was an ancient unknown thing, the other a reasonable 105 hub and rim. They were different widths! I found the matching 105 rear wheel and cleaned them up (they weren’t originals, I had already replaced them a few years ago). 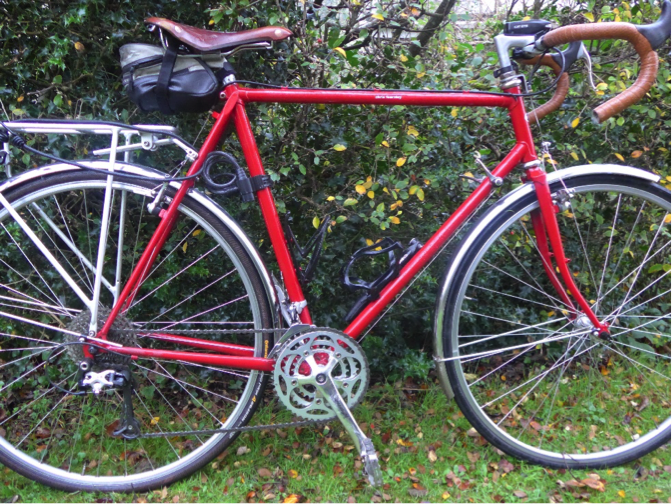 After my first trip away with the restored bike, I swapped the wheels for some second-hand Ksyrium SLs. These are much lighter, they’re racing wheels and usually not recommended for touring, but I’m light enough. They certainly made the bike go faster! But only to be used in the summer; winter grit would ruin these thin rims too quickly. Putting it all back together: The hardest bit was probably assembling the headset (although I had taken photos of the order of the parts beforehand). Apart from standard allen keys and spanners, my only special tools are to fit the cassette and the bottom bracket. After one or two test rides and minor adjustments, it was ready for its first tour. Total cost: I lost count. Less than the new bike I would otherwise have purchased. I’ve admired that bike. I admire it and it’s proud owner even more now.